This event was open to all our members and the public from 10am to 3pm. 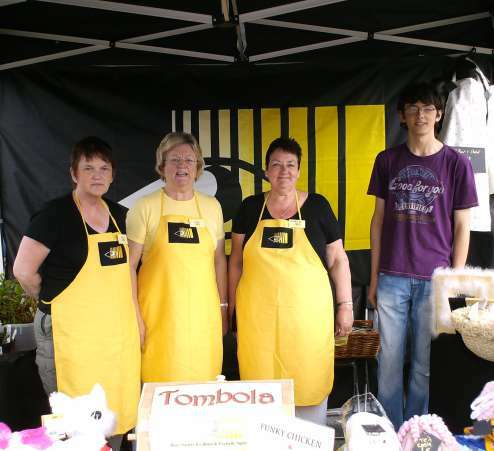 There was a wide variety of inexpensive crafts and gifts to purchase plus tombola. There was entertainment too, a male vocalist in the café area, also “Card Tricks” by Carl plus a choir with some of our members singing. If you got a little peckish there was a café where you were able to purchase refreshments all day or even treat yourself to one of our home made cakes and jams to take home. There will aslo a children’s corner too with games and activities and a chance to also meet our new puppy mascot! We had a great turnout from the public and our members and just short of £2000 was raised. We would like to thank all our volunteers, staff and members who made this day a huge success. 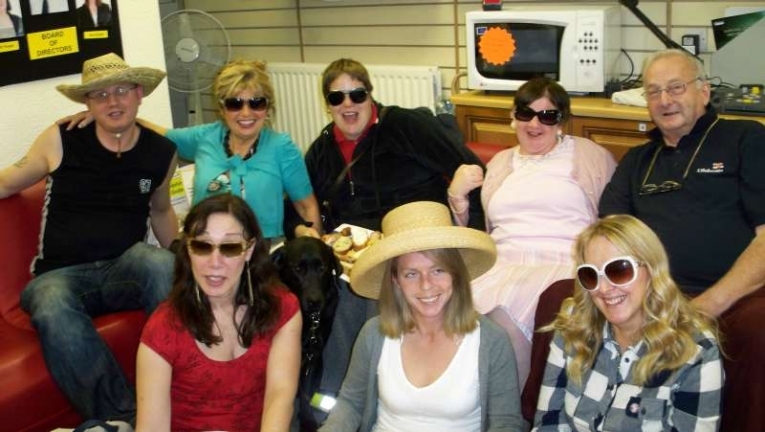 On the 27th of October Bury Society for Blind and Partially Sighted People hosted a “Volunteer Recruitment Day”. There was experienced volunteers on hand to answer any questions about our volunteer roles. We had some interest at the event with four people signing up. 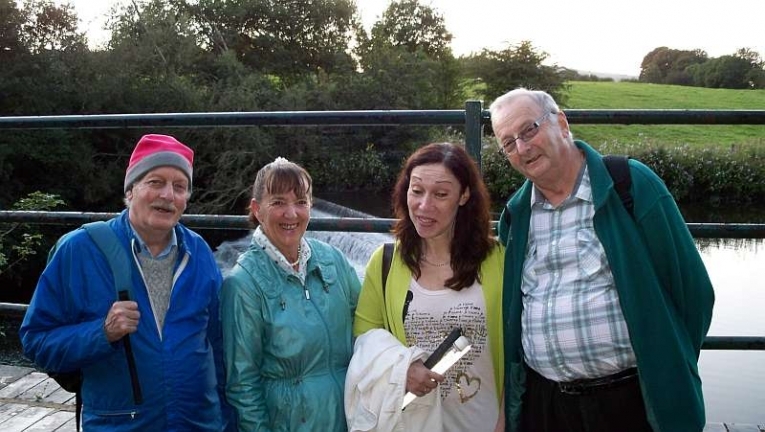 As a result of the rain that we experienced this summer, the Annual Society Picnic was held in the Resource Centre on Friday 19th September 2010. 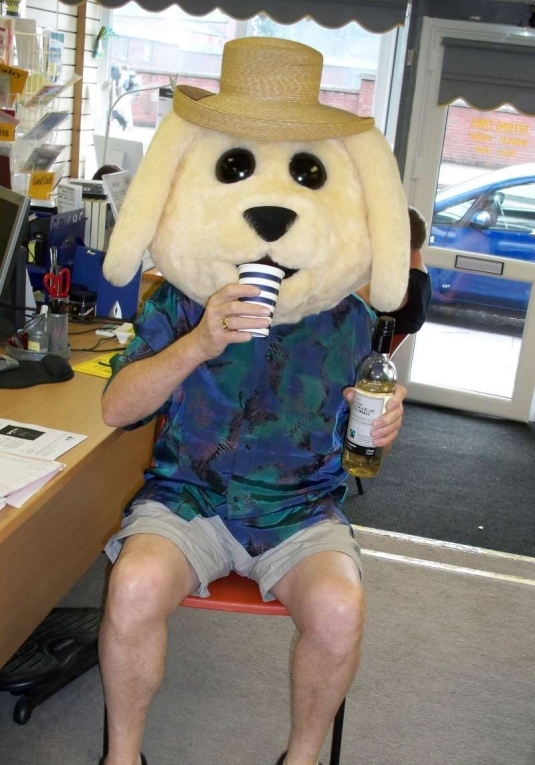 Our new Puppy mascot joined members, volunteers, directors and staff, who put on their summer outfits to enjoy an afternoon of fun and frivolity, not to mention plenty of food and drink. Daniel Marno, son of member Tracey Marno, brought along his guitar to provide the entertainment, and everyone was encouraged to enter the competition to name the Puppy mascot, with some trying to bribe the puppy with drink in the hope that it would reveal the answer! Our first “Italian” meal with the Society in September started with a surprise… We were in the wrong Italian restaurant! After being told by the front of house staff that there was no large party booked in that evening, a very hasty call was made to Darren to find out where we should be. The evening just got better and better after that. We were made very welcome by everyone we met. We had a wonderful meal and there was lively conversation throughout. It was Dave’s lucky night too; he won a large red handbag to go home with. 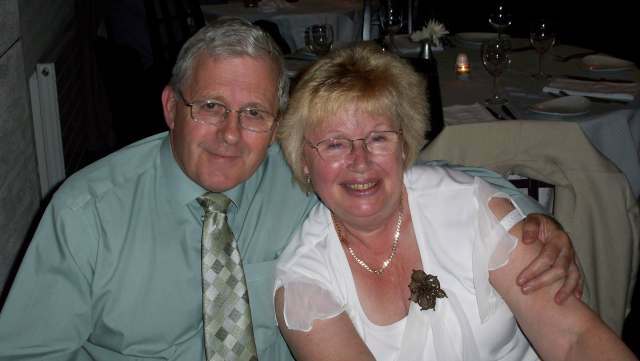 Gwynneth (member and volunteer) & David (volunteer) Hellewell. On Tuseday the 17th of August five of us set out from the society for our walk around Burrs Country Park. On the way our guide pointed out points of interests including the new police station. This was very good because I didn’t know how to get to it on foot. Not that I have any plans for a visit soon! On the way to Burrs Country Park we passed Entwistles farm and the stench from the chickens was unbelievable. We managed to hold our breath long enough to finally get to the park. Our journey around the park took us past the giant mouse trap and we stopped at the stone circle to feel the markings on the stones. We continued our walk along the river Irwell until we came to the waterfall. The noise from the waterfall was quite loud and we had to raise our voices to speak. Upon continuing our walk we went passed the caravan park and stumbled on a pub. Not to miss out on a golden opportunity we all decided to go in for a drink. Whilst in the pub two young lads arrived and proceeded to serenade us on acoustic guitars. We had a couple of drinks and decided to move on. To our surprise when we left the pub the daytime had disappeared. We had an important decision to make. Do we get a taxi or should we be brave and walk back by moonlight? We decided to be brave and took the second option because we were all in good company and all felt very safe. At times it was a little darker along the way and we had to use our mobile phone to light the path. I must say without the help of the Bury Blind Society I would never attempt a walk like this, in fact I wouldn’t have a social life. For this I am very grateful. So why don’t you join us on our next walk or any other social events and get out and about safely. 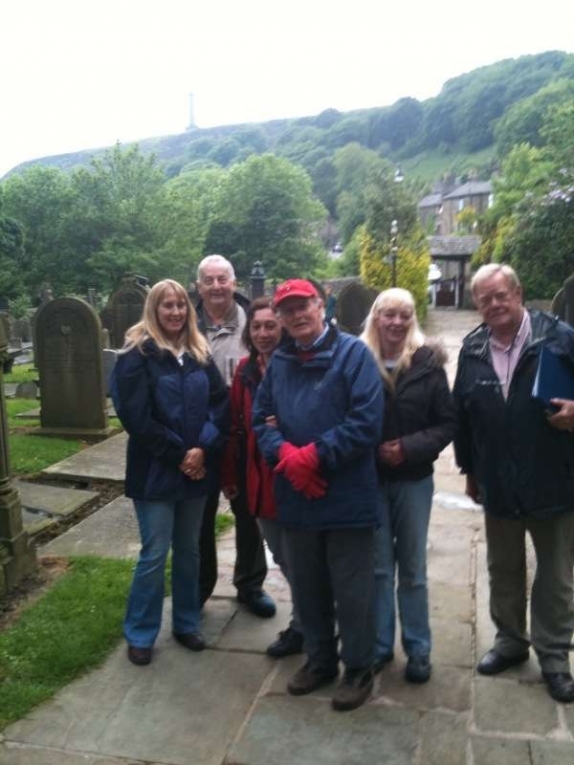 Ten people attended the walk made up of members and guides on a very pleasant evening, although rain was forecast. We took a Metrolink ride down to Radcliffe station and, from Spring Lane we were able to walk through to the canal towpath. Off we went for the three mile walk at a steady pace. No one was left trying to keep up but one or two did get ahead and had to wait for the group. Stimulating conversation accompanied the birds singing in the trees and a great evening was had by all, including James my guide dog who enjoyed meeting new friends and getting lots of fussing. The whole trip took just over two hours and the rain did not appear. We look forward to the next trip to the Wind Farm on Scout Moor sometime soon. What fabulous weather we all experienced on the four weekends in June which most certainly helped make the Carnivals in Radcliffe, Bury and Prestwich plus the fantastic Bury Show great successes for all concerned. It was great to see these traditional events being enjoyed and well supported by families all over the borough. To all the organisers, congratulations on a job well done. These events were great opportunities for both charities and small businesses alike to generate income and I would like to express thanks in particular to all those kind people who supported our new Craft stall and were so very generous helping us in raising funds for Bury Society For The Blind. Long may these impressive traditional events continue and be well supported. The first of our summer walks was on Tuesday 7th June. so after a long spell of lovely weather we were all looking forward to of our summer walks and yes we wake up to rain. Oh no is the walk still on? Oh yes we carry on regardless was the reply. However in time for our walk the rain had stopped and a group of us met up at the Shoulder of Mutton pub in Holcombe village. We began sitting outside in the beer garden where we met our guide John Ireland, he began by telling us some of the history of the pub and the village we then walked to the church where John told us lots of interesting, comical and historical facts. Our walk then went up to the School and down the main road through the village stopping now and then for John to point something out or to tell us more about this little village non of us could believe so much had taken place here, We then finished the evening of back inside the Shoulder of Mutton pub for a couple of beers only to find it was quiz night so we joined in that too. What a fun evening much more than just a walk and we would like to give many thanks to our guide John Ireland who has kindly offered to do this again next year. Maurice Clegg who submitted 5 of the winning photographs. Congratulations to all our winners, and many thanks to everyone who entered the competition, choosing the 12 pictures was not easy, as all the pictures entered were very good. The calendar will be on sale in the Resource Centre this autumn. 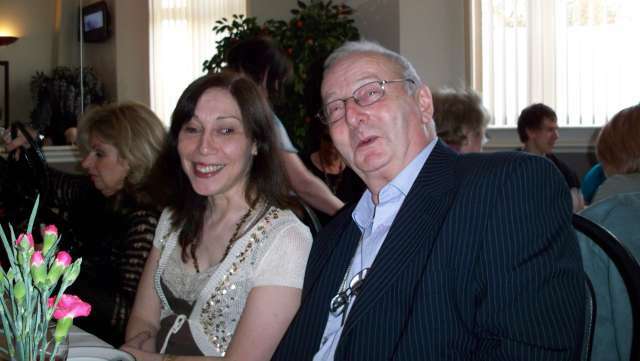 The Annual Summer Outing for the members of the Bury Society for Blind and Partially Sighted People is to Millstones at Harrogate on Thursday 3rd June. As you are visually impaired you must be accompanied by a friend capable of guiding and looking after you. The trip, including lunch will be provided at a cost of £15 per person. Places are limited so please book early to avoid disappointment. After lunch entertainment begins with the resident entertainer and guest artists who will provide music from the war time years. There is also a gift shop on site for browsing. More pictures of our trip are available in the Gallery. On June 3rd this year I went with my friend on the annual Summer outing for blind and partially sighted people. I must admit my friend and I were sceptical about this. We had a preconceived idea we would finish up in some draughty church hall with a load of elderly people half asleep listening to ancient records of George Formby and Gracie Fields - big bore!! However we were in for a very pleasant surprise. For a start the weather was gorgeous, obviously a good sign. We all met up outside the Art picture house and set off for Harrogate 10am. The mayor saw us off. We travelled the scenic route through the lovely countryside. We arrived at Millstones at approx 11.30. The venue was not an old fashioned church hall but a lovely country house set in gardens. There was a bar and lovely gift shop where we bought a million calorie lemon drizzle cake and some lovely gifts to lighten our purses. There was a lovely dining room with a dance floor and plenty of room. The meal was delicious and would be hard to fault. We all enjoyed the entertainment and nobody fell asleep. There was dancing and singing which was very much enjoyed by everyone. We even had a game of Bingo, alas I did not win! When it was time to leave we went a different route back and had a lovely evening run home. 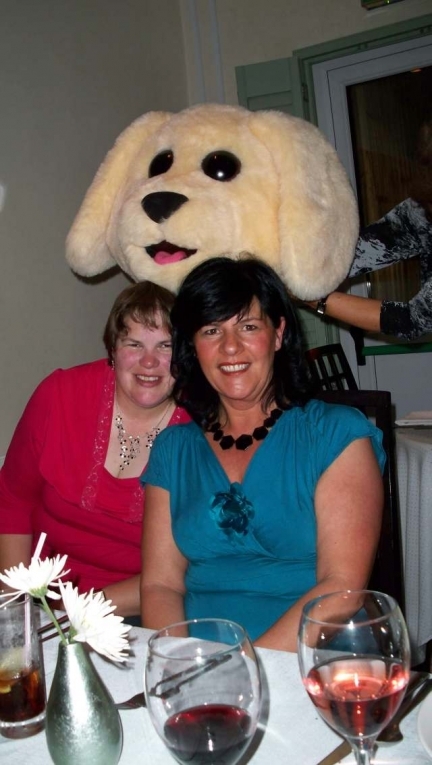 On Monday 19th April we visited the Jewel in the Crown restaurant for our annual Curry Night. We had an excellent meal served by polite, efficient and well mannered staff making it a delight to be there. But most of all it was a pleasure to meet friends both old and new. I have never known an evening to pass so quickly. Many thanks, to all the Society staff and volunteers who made this lovely evening possible. Good food, Good wine, Good friends, what more could anyone want? More than 260 people visiting the Millgate Shopping Centre voted for their favourite photograph which will be used on the 2011 Bury Calendar. The winning picture was of a waterfall in Redisher Woods and was taken by Maurice Clegg from Radcliffe. The other 11 Photographs will chosen by a panel of judges made up from representatives of the Society, Bury Council, the Millgate, the Bury Times and of course our president The Mayor of Bury. The first walk of 2010 will be held on Tuesday 27th April. The Group will be taking in the delights of Burrs Country Park and will no doubt be stopping for refreshments at the Brown Cow!!! 3 routes have been planned to take account of all needs, so whether you want a gentle afternoon stroll or prefer something more challenging, everyone will be accommodated. Many thanks to everybody who has submitted prints for our Photograph Competition. All the pictures will be displayed in the Millgate Shopping Centre on Wednesday 21st April 2010 when the general public will get the chance to vote for their favourite print. 11 more photographs will be chosen from the remaining entries by an independent panel of judges. All the chosen photographs, which show scenes of interest or images of natural beauty from Bury and the surrounding areas, will feature in the Bury Calendar 2011 which will go on sale in the autumn. Make sure you have your say which photograph you would like to see on the calendar, the stand will be sited next to Marks & Spencer between 10 a.m and 4 p.m. on Wednesday 21st April. Make sure you use your vote!! Our Gift Wrapping event for Mothers Day at the Millgate Centre, Bury raised almost £800 !!! Many thanks to all who made this super total possible. Ferrero Rocher eating contest - the winner to represent the Society at Ramsbottom Chocolate festival. Can you beat 8 in a minute??? Chocs galore - chocolate drinks, cakes biscuits, spread, ice cream and not forgetting chocolates. It will be chocolate licking good!!! Our next major fundraising event is a Quiz night which will be held at the Mosses, Cecil Street, Bury on the evening of Friday 26th March. Full details available from our Bolton Street Resource Centre or telephone Jackie Barton (0161 763 7014) – but hurry, places are limited ! We are hoping to arrange an activity weekend at the Bury Jubilee Centre, which is based in Glenridding near Ullswater in the Lake District. The hostel was opened in 1984, and fully refurbished in 1996. It accommodates 28 people and priority is given to young people and residents of the Bury area, facilities include a fully equipped self catering kitchen, large dining room, 3 En suite bedrooms with bunk beds sleeping 6, 10, and 12 people, a drying room and a payphone. Activities in the area include walking, hiking, climbing, canoeing, kayaking, sailing and windsurfing, or you can just take a relaxing cruise around the Lake on a steamer. If anyone is interested in enjoying 2 days away with like minded people, please contact Diane Webb on 0161 763 7014 and she will give you more information. The monthly Mystery Raffle continues to be very popular, and we would like to thank all the Friends of the Society who have donated prizes for the raffle which are much appreciated. If anyone would like to donate a prize for future raffles please bring it to the Resource Centre on Bolton Street. To date we have raised a wonderful £675 which all goes to helping our members. Following on from the success of the Christmas event a smaller team of Wrappers took station in the Millgate for two days in February, offering a Wrapping service for Valentine’s Day. The results were terrific – nearly £700 raised ! Again, our thanks to everyone who took part and supported the Society. We were delighted that our President, the worshipful Mayor of Bury (Councillor Sheila Magnall) agreed to host a “President’s Evening” for the Society and very much hope that this will prove to be a precedent for future years. The event “Wines for Valentines” was held in the Mayor’s Parlour on Friday 5th February and was supported by over 40 people. A very tasty evening, raising a very tasty profit of over £330 ! We are, as always, almost totally dependent on our volunteers for much of our success. It was thus our pleasure to host two volunteers parties at Bolton Street at the end of January. Over 100 volunteers attended and enjoyed a delicious buffet. A new innovation this was the presentation of “long-service” badges for volunteers who had been with the Society for over 2 years (bronze badges), over 5 years (sliver badges) and over 10 years (gold badges). We were delighted, at the afternoon volunteer’s party, to welcome Reverend Elizabeth Binns (Deputy Lord Lieutenant of Greater Manchester) who came along to present a Grant cheque to the Society. Other Trusts who have supported us over the last few months have been the Alchemy foundation, The Coward Trust and The Lee Bakirgian Family Trust. We are grateful to all of them for their generous help.